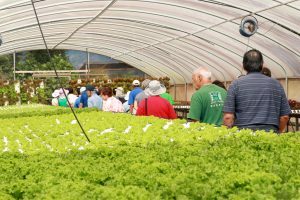 We welcome students, teachers and chaperones to take an educational journey through The Gardens with our knowledgeable and professional tour guides, then join in on some of the activities to manage a farm. In 2017 we hosted over 4,000 students at our farm! Discover and explore the wonderful world of soilless farming with our knowledgeable staff guiding you through the gardens. This is a brief 45 minute overview and tour of our farm. 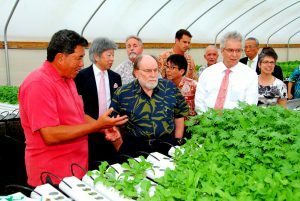 We hope that this tour will spark new ideas and renew interests in locally grown foods as you gain a deeper understanding of Hawaii’s food systems and the impact it has on society. Get an exclusive Behind-The-Scenes tour of our aquaponic facility. This 1 hour and 30 minutes tour grants you access to all of our food production systems. Our tour guides are working members of the farm’s many operations so you can be assured that the information provided is coming from first-hand experience. 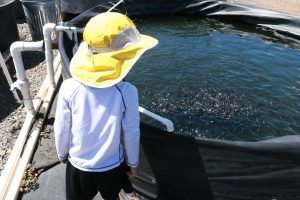 See what it takes to run a commercial aquaponic farm from experts in this field!